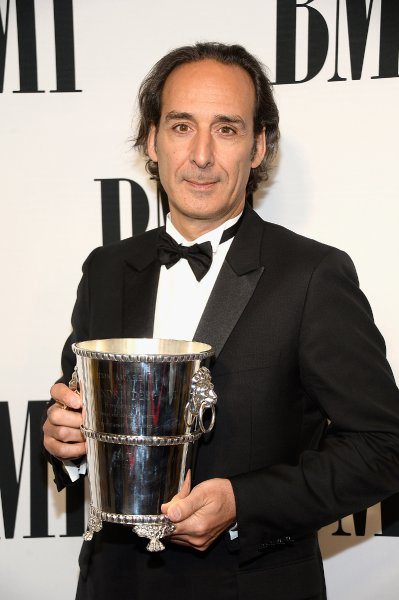 BEVERLY HILLS, Calif.—Alexandre Desplat received the Icon Award from performing-rights society Broadcast Music Inc. (BMI) at its annual Film/TV Awards Wednesday night at the Beverly Wilshire Hotel. Approximately 650 members of the composing and songwriting community attended. Desplat, the prolific French composer who won the Oscar in February for The Grand Budapest Hotel, accepted the award – given to composers "who have made significant contributions to the realm of film and television music" – from BMI president-CEO Mike O'Neill and VP of film/TV relations Doreen Ringer Ross. Desplat recalled his father's love of American jazz and his own youthful attempts as a flutist to replicate classic jazz solos. He thanked "the American musicians who have accepted me (and) who record my music in the studios here. They are the people I respect the most, because it's the hardest thing being a musician; the discipline that it requires is incredible." Desplat also cited several composers who had influenced him including Bernard Herrmann, Jerry Goldsmith, Alex North and John Williams. "They opened a path to all of us," he said. He also thanked friends, family and colleagues including longtime agent Laura Engel. O'Neill, in presenting the award, said Desplat was "steeped in cinema. He speaks the language of film... He tailors his music to the specifics of the story to determine what textures, what atmosphere, what musical colors might best fit the film." Ten of his films have been Best Picture Oscar nominees over the past nine years, he pointed out. The composer was saluted in a video that featured clips from many of his films and comments from directors including Morten Tyldum (The Imitation Game), who said "it was like watching a genius create"; Stephen Frears (Philomena), who found "his reading of the films... very clever"; Tom Hooper (The King's Speech), who praised his "openness"; Gareth Edwards (Godzilla), who noted, "it's like magic, an alchemy, I don't understand where it comes from"; and Wes Anderson (The Grand Budapest Hotel), who called himself a "friend, collaborator and great fan." Also honored was Chris Montan, president of Walt Disney Music, with BMI's Classic Contribution Award. The executive music producer for all the studio's animated features, he is a former singer-songwriter who was praised in a video by such musical luminaries as Randy Newman, Alan Menken, Phil Collins and Danny Elfman, and by fellow Disney executives Thomas Schumacher and John Lasseter. Montan drew applause for his explanation that, at Disney, "we are here to serve the writer, the writer is everything," referring to composers and songwriters who helped shape such modern classics as The Little Mermaid, Beauty and the Beast, Aladdin, The Lion King and Frozen. Awards were also given to composers and songwriters responsible for the music of the highest-grossing films and highest-rated television programs of the past year. Among those attending, and receiving awards, were Brian Tyler (Furious 7), Tyler Bates (Guardians of the Galaxy), Atticus Ross (Gone Girl), Aaron Zigman (The Other Woman) and Christopher Lennertz (Think Like a Man Too). Desplat accepted awards for Godzilla, Unbroken and The Imitation Game. Among TV winners were Brian Tyler (Scorpion, Hawaii Five-0), Fil Eisler and Jim Beanz (Empire), Blake Neely (The Flash, The Mentalist), Ramin Djawadi (Person of Interest, Game of Thrones), Mark Isham (American Crime), Snuffy and Will Walden (Under the Dome), Nathan Barr (True Blood), Edward Shearmur (Devious Maids), Charlie Clouser and Mac Quayle (American Horror Story) Kurt Farquhar (The Game) and Regina Spektor and Gwendolyn Sanford (Orange Is the New Black). 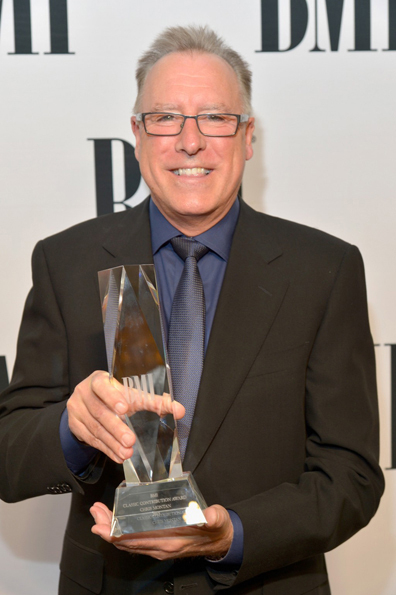 Veteran TV composer Mike Post received his 52nd BMI award for Law & Order: SVU.